The measure of a good steak house is their tuna tartare. 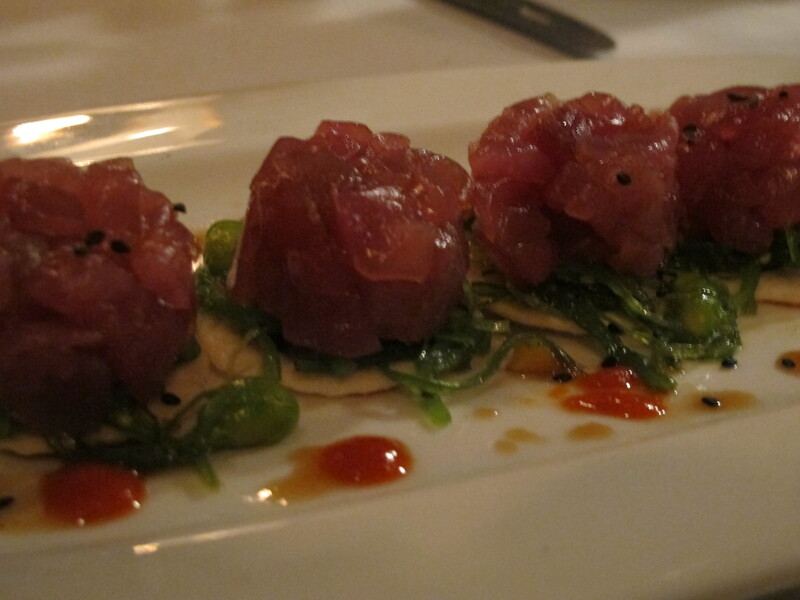 At 22 Bowen’s Wine Bar and Grille, the tuna is fresh, sans membrane, tender, and the perfect temperature. The steak is also very good. 22 Bowen’s is right on the wharf in Newport, a quick walk from the town center. The customer base is eclectic, at least in the off-season – couples of all ages, “girls night out” packs, single guys looking for a hot date. The menu is just as varied, in a good way – this is not a place that forces you to eat a “king cut” with a tub of mashed potatoes before they wheel you out on a stretcher. Granted, they do serve truffled mac and cheese (did not try it, too bad), but they also have sherry roasted mushrooms (did try, delicious) or even just a plain baked potato. Steaks are very reasonably priced and come with your choice of sauce – hollandaise, horseradish cream, flavored butter, red wine demi-glace. For my 8 oz filet mignon (expertly crusted and seasoned) I chose a béarnaise, much nicer than the red wine demi-glace Dave picked. His Delmonico steak, however, was perfect. Dessert was the only downer of the evening, our piece of chocolate cake was huge but dry. The next time I go, I’ll just have the truffled mac and cheese for dessert, and roll myself out the door. Voila.